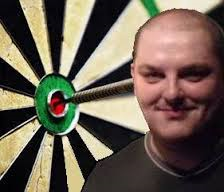 Welshman Kevin Thomas started to play darts when he was six years old. He played county for many years, was member of the Welsh national team and qualified two times for the Winmau World Masters. 2012 he was the Welsh number 1. 2013 Thomas took part in the PDC Qualifying School, but didn't win a Tour Card. As an associate PDPA member he played the UK Open Qualifiers and qualified for the tournament but lost first round. During the second qualifier for the UK Open he threw a nine-darter. Thomas admits that he is not interested in practice and rarely practices.